The text in the large white cartouche reads: 名月や畳の上に松の影 其角. "A lady looks at the shadow of pine branches thrown by a bright moon onto the straw mats of her room. That the setting is a teahouse is indicated by the furo, three-legged brazier to the left of the design, and by the rough wood pillar of the tokonoma, ceremonial alcove, to the right. But it is an unusually opulent teahouse. The screen to the left, painted in the brightly colored Rimpa style, is rather gaudy for a teahouse, and the area is large, with tatami mats extending into the foreground. It is a teahouse of the pleasure quarters, either a house where assignations are arranged, or a teahouse in a large and luxurious brothel. The lady is probably a courtesan, though neither her robes nor hairstyle confirm this. She wears two half-open undergarments, with her under-sash (not obi) untied and falling in front of her. Her simple hairstyle - a courtesan on duty would have many more ornaments in her hair - might be explained if she has just come from a bath. There are no suggestions that she is entertaining a customer (conventions might include smoking utensils left on the floor, or used tissues), and she is probably relaxing alone late at night. There are more than a few hints that this design pays homage to Utamaro (1754-1806), the most celebrated designer of prints of the pleasure quarters. The lady's hairstyle is in the fashion of the 1790s, when the dominant ukiyo-e artist was Utamaro, not in the fashion of a hundred years earlier, when the poem in the title cartouche was written. The screen is painted int he style of Utamaro's contemporary Sakai Hōitsu, who revived the decorative style of Ogata Kōrin at the end of the eighteenth century. Lamplight is thrown a bamboo screen, the printing techniques for which were perfected in Utamaro's prints. The lady holds an uchiwa, round fan (round like the moon? 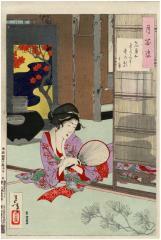 ), which was a favorite motif of Utamaro's. The lady is very sensual, like a figure by Utamaro, who is best known for his prints of women of the Yoshiwara caught at informal moments in their daily lives." Quoted from: Yoshitoshi's One Hundred Aspects fo the Moon by John Stevenson, #5, p. 25. This is accompanied by a full-page illustration in color.